Here is a healthy little snack. If you love chips and you always try to find a healthy alternative, well these kale chips will do the trick. They have that super crunch and crispyness that you want. You can get fresh kale at the store and remove the stems or you can go ahead and buy the pre packaged stuff. I used Organic Girl 100% Baby Kale. I love their products. The freshness in every package is great. With these chips you can have fun using any topping you would like. People have even told me they use cheese, which I will try next time. Before you begin make sure your kale is completely dry with no moisture on it. Next place the kale in a large bowl drizzle some olive oil and toss. Take 2 baking sheets and place the kale on them and spread out. Place one baking sheet in the oven at a time. Bake for 20 minutes rotate half way through. When finished season to taste. 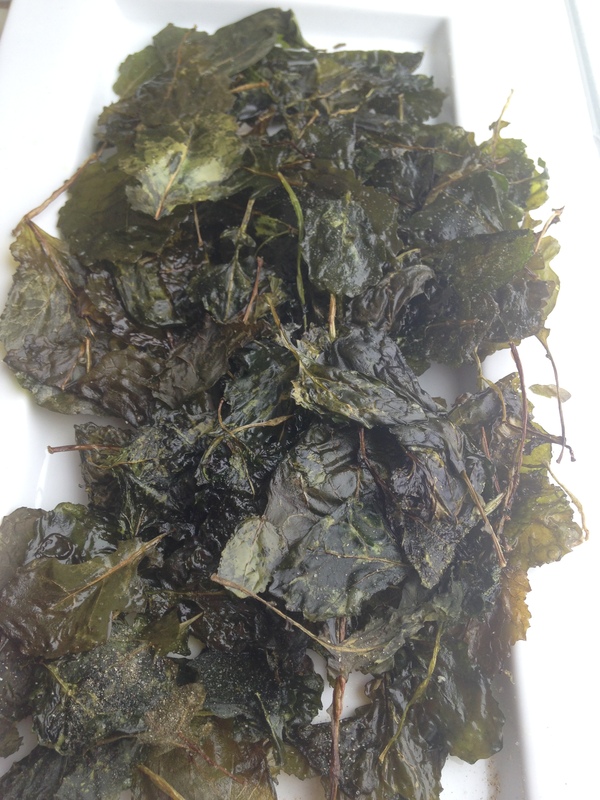 I just posted kale chips, too!!! Love them. They are such a great alternative to real chips. This is so simple and economical. They charge an arm and a leg for the packaged kale chips! I’m totally obsessed with kale chips! Even my 10 month old loves them. Kale chips are addicting! I like to add a bit of chili powder and/or paprika for a bit of kick. Just seeded kale in my greenhouse raised bed, can’t wait for homegrown chips!